At least you've got a great box. Hey, that's something! Life is just a box of cat. Tee-hee! Unfurbro the younger had on a shirt today...it said *MEH*...MOL!! Well, that's what happens when you get busted! You are just too gorgeous for words!! Maxie, you got box fatigue? But it's a NICE box!! That box appears to be just the right fit for you! 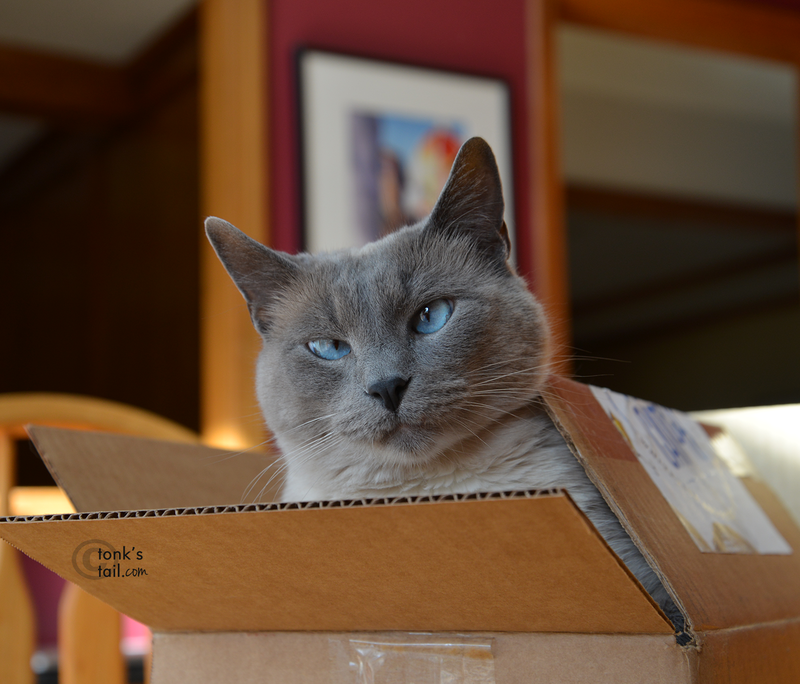 How can it be "meh" when you've got a great box, Maxie?? You are CALM, Chissymouse Eve? Do you tend to find trouble when you get bored? Well, at least you found a nice, cozy box. Right? Hmm it could have been worse, you could have been thrown in the can, or the jug! Post office wouldn't guarantee you delivery to Maine by Christmas?